The purpose of this post is to communicate the process and level of service for snow removal and ice control for the Town of Milton. The Town of Milton, Public Works Department, is responsible for snow removal and ice control on municipal streets and sidewalks within the Town limits. The goal of the Public Works Department is to remove snow and ice from streets and sidewalks as safely and efficiently as possible, all while keeping roads open for essential travel. Delaware Department of Transportation (DELDOT) is responsible for snow removal on State streets which are Federal, Union, and Mulberry Streets, as well as a portion of Front and Atlantic Streets. When snow removal begins in Milton, primary streets, defined as streets that have ingress and egress points on the above mentioned State streets, are cleared first. After primary streets are passable, secondary streets are cleared, then followed by streets within subdivisions. Snow and ice removal on any privately owned street, alley, and lane are not the responsibility of the Town. It’s important to note that snow removal doesn’t mean pavement will be totally clear of snow, but rather in a safe and passable condition. Once all streets are passable, the Public Works Department will begin to clear snow and ice from municipally owned sidewalks. For the safety of pedestrians, snow and ice must be removed from sidewalks in the public right-of-way within 24 hours after snow ceases. 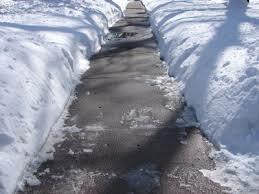 When removing snow from the sidewalks, do not push or throw the snow or ice into the streets. § 183-54. Responsibility for removal of snow; violations and penalties. It shall be unlawful for the owner or occupant of any premises in the Town of Milton, in front or by the side of which shall be a sidewalk, to permit or allow any snowfall exceeding two inches to remain thereon for a longer period than 24 hours after it shall have ceased snowing, and every person who shall permit or suffer the same to remain on said sidewalk in violation of this article and he, she, or they, so offending, shall forfeit and pay a fine of $50 for such offense to be collected as fines of like amounts are collected. Each additional twenty-four-hour period in which a person permits or suffers the same to remain on the sidewalk shall be a separate violation, punishable by a fee of $25 to $50. If the Town removes the same, in addition to the aforementioned fine, the cost or value of removing the same shall be recovered from the persons jointly and severally responsible for the same. § 183-55. Snow not to be thrown onto street or road; violations and penalties. It shall be unlawful for the owner or occupant of any premises in the Town of Milton to permit or allow snow to be pushed or thrown onto any street or road in the Town of Milton, and every person who shall permit the same shall be in violation of this article and he, she, or they, so offending, shall forfeit and pay a fine of $50 for such offense to be collected as fines of like amounts are collected, and it shall be the duty of the Street Committee to have the said snow removed immediately, and the cost of removing the same shall be recovered from the persons responsible for the same.